CMOs and their digital leaders are fighting an uphill battle. The challenge? Convincing the C-suite that social media investment is worth a damn. Most CMOs, however, are going into this battle without armor. Only 18 percent of CMOs can quantitatively show the impact of social media performance on their business. That’s just poor preparation. CEOs are among the biggest skeptics of social spend. A PWC study finds that 69 percent of CEOs think it’s harder for businesses to earn — and keep — consumer trust in the digital world, and social media is one of their biggest concerns. The study shows that 87 percent of CEOs say social media could negatively impact trust in their industry over the next five years. Although their skepticism may be valid, as a marketing leader, you know that social media adds value to your organization. Your challenge is to prove it. So how can you get the rest of the C-suite on board? Here’s how to do it. There’s no time to lose in showing other executives the impact of your social media initiatives — if you want to keep your budget, that is. 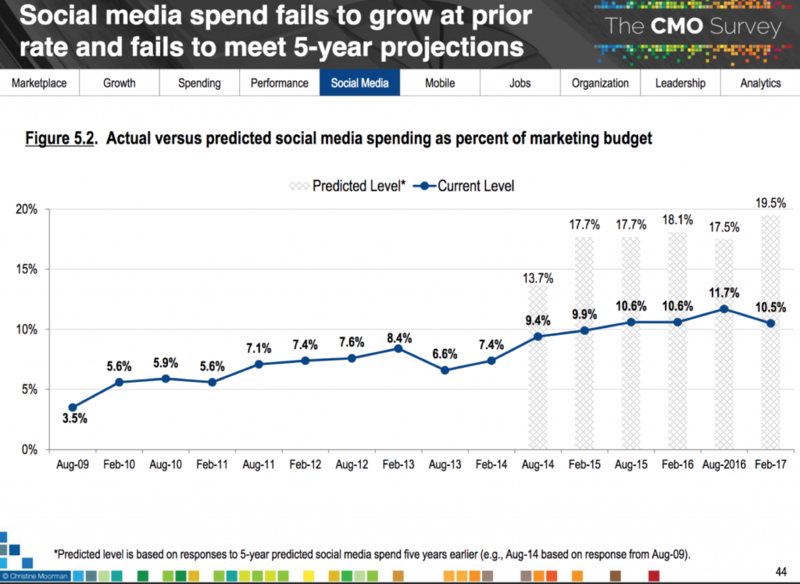 The CMO Survey notes that, although CMOs plan to spend up to 90 percent more on social in the next five years, actual spending has not kept up with projections. Christine Moorman, director of the CMO survey, notes that the most compelling reason for this discrepancy is that companies aren’t effectively using their social media investments: “When this happens, acceptable ROI is not achieved and budgets are reduced below past expectations,” she wrote. There are a couple of things we can infer from this data, and Moorman’s explanation. First, you need to monitor your social media interactions over time to be sure you’re doing more of the right things. Second, you need to be able to demonstrate the ROI of those efforts so you don’t end up losing your budget. Social media and marketing strategies aren’t aligned: On a scale of 1-7 (1 = Not Integrated, 7 = Very Integrated), CMOs note that their social media and overall marketing strategy are only somewhat linked (4.1 rating). By working to align strategies and KPIs, you can ensure your social media initiatives are contributing to larger goals, and that social’s value is more visible to the C-suite. Customer information isn’t effectively shared across the organization: CMOs give a 3.4 rating on the 7-point scale for how their company integrates information across purchasing, communication and social media channels. You can show value by proving how social contributes to providing customer insights to the entire organization. Firms lack quantitative metrics to prove marketing spend: Only 37 percent of companies can demonstrate the short-term impact of marketing spend quantitatively, and only 35 percent can show long-term impact. Track how every social channel contributes to the organization’s bottom line. You should also set the right expectations that top-of-funnel activities, which drive brand awareness, will take longer to prove than bottom-of-funnel conversions and sales. Just because you understand the value of social doesn’t mean everyone else does. Consider this: 60 percent of Fortune 500 CEOs have no social media presence whatsoever. There could be many reasons for this: They don’t see the value, they don’t have time, or they think it’s risky, as we’ve already noted. 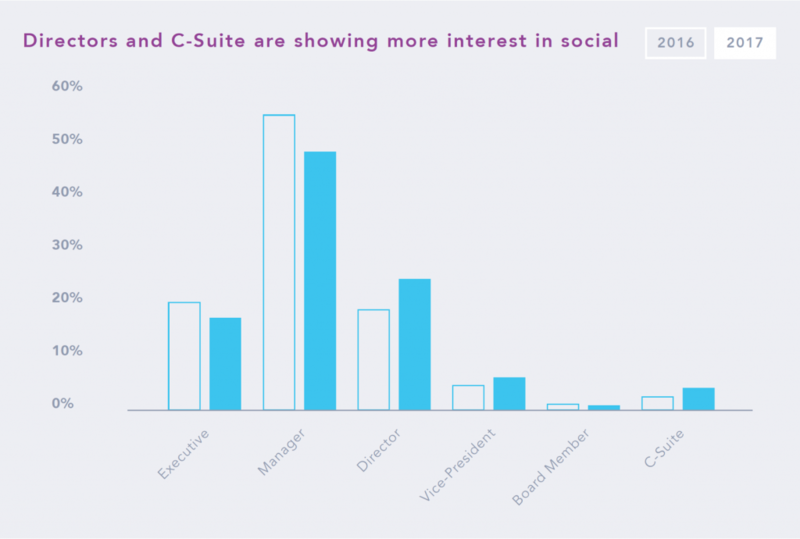 Although another study shows that the C-suite is showing more interest in social, that interest is still quite low. Clearly, there’s a lot more work to be done to get them to see your side of the social story. One way to get those numbers to increase is to make sure you’re speaking the C-suite’s language. This means dollars, ROI, and beating the competition when talking to the CEO and CFO. The CIO or CTO will also want to talk savings and efficiency, so you might highlight how your social media analytics tools increase efficiency by sharing customer insights across departments, as well as how they integrate with your existing systems. Don’t forget that CEOs are also concerned with trust and social media. Make sure to highlight that in order to build trust, your company has to first be a part of the social conversation. Another way to bring social out from the shadows is to talk to executives about what your competitors are doing. This is where social media monitoring and share of voice come in. Your social media analytics platform can help you understand what your competitors are discussing and how customers are responding. Keeping up with, and getting ahead of the competition is a major motivator for C-suite executives. Another advantage of a competitive perspective is the ability to understand what your customers are interested in, what they’re happy about, and which concerns need to be addressed. In other words, the ability to build trust with your customers. Unfortunately, many organizations don’t do such a great job in this area. 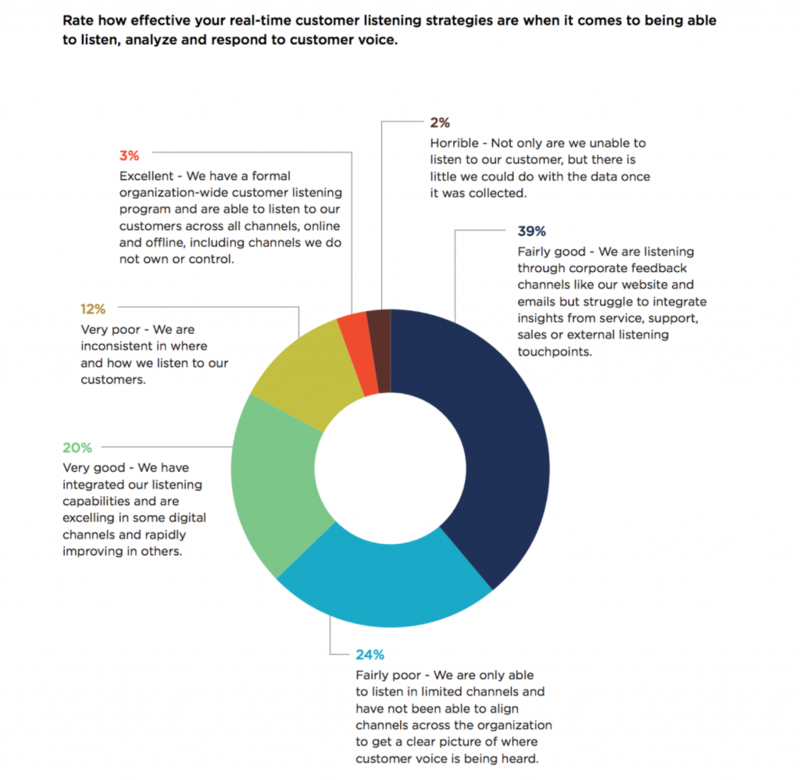 Only 23 percent of CMOs believe they are very good or excellent at listening, analyzing, and responding in real time to customers. If you can show the CEO how social media monitoring helps build trust with customers by allowing your organization to quickly address their concerns, they’ll see that you really understand their priorities, and will be more likely to listen when you ask for a higher budget. Marketing attribution might sound complicated, but with the right tools, it’s not out of your reach. Monitor your social media performance by examining how every post on every social channel contributes to your company’s pipeline, revenue, and deals. Not only will you have numbers to show your fellow C-suite executives, but you’ll also be able to optimize your efforts along the way to make those numbers even stronger down the line. Social media is perceived to contribute little to company performance, but with the right tools and tactics, you can change that perception. And wrap up a hefty budget, to boot.